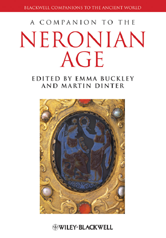 An authoritative overview and helpful resource for students and scholars of Roman history and Latin literature during the reign of Nero.The first book of its kind to treat this era, which has gained in popularity in recent years. Makes much important research available in English for the first time. Features a balance of new research with established critical lines. Offers an unusual breadth and range of material, including substantial treatments of politics, administration, the imperial court, art, archaeology, literature and reception studies. Includes a mix of established scholars and groundbreaking new voices.